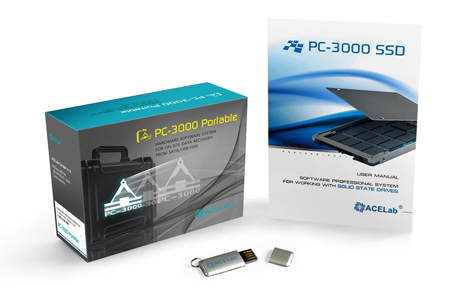 The PC-3000 SSD Software System operates in tandem with one of the three up-to-date hardware platforms – PC-3000 Express, PC-3000 UDMA, or PC-3000 Portable – and it is intended for SSD repair and diagnosis and for data recovery from SSDs with SATA, PATA, mSATA, and M.2 (NGFF) interfaces and the capacity from 64 GB to 1 Tb produced by different manufacturers, such as OCZ, Corsair, Crucial, RunCore, A-DATA, G.Skill, Micron, Plextor, Intel, Samsung, Seagate, Kingston and others. The PC-3000 SSD contains a set of specialized utilities for working with solid-state drives. This set includes the Universal Utility for diagnosing any SSD based on the ATA-8 specification (both currently existing models and those that will be manufactured in future) and the Active Utilities (Special Utilities) intended for working with a particular drive model in technological mode. It enables to deeply diagnose SSDs, to perform service operations, to re-write the drive’s microcode, to get direct access to memory chips, to carry out low-level formatting blocking the damaged cells and placing their addresses into the defect table, and to perform many other useful operations. The list of Active Utilities of the PC-3000 SSD System is expanded as soon as new SSD models are studied, and it is a continuous process. Those utilities that are currently available allow you to successfully recover data from all contemporary solid-state drives and to resolve the majority of wide-spread SSD problems. It is planned to add special adapters and connectors that will allow to use technological interfaces to diagnose and repair drives. There is no need when the PC-3000 SSD will be shipped when you have an urgent SSD recovery case from your important customer. The new adapter is designated to connect SSD devices based on M.2 Key B or Key (B+M) interface to the PC-3000 ports. This type of drives uses a SATA interface in a small-sized M.2 form factor. The adapter has a 3.3 V power supply indicator and a drive activity indicator. It is compatible with single and double-sided modules, classes D1-D5, sized Type 2230, Type 2242, Type 2260, Type 2280. The new adapter connects mSATA-interfaced SSD devices to the PC-3000 ports. This type of SSD has a SATA interface in a small-sized mSATA form factor. The adapter is equipped with a 3.3 V power supply indicator and a drive activity indicator. It is compatible with Full Size and Half Size modules.